Jelly from Almo Nature HFC is a food supplement for cats. The vegetable gelatine in the food helps to remove hairballs. Almo Nature HFC - Jelly is a meal for cats consisting of pure meat, pure fish and vegetable gelatine. This vegetable gelatine is a natural solution that helps to remove hairballs formed in cats during their daily grooming. In addition, the food contains fresh, natural ingredients that were intended for human consumption, but are now used in this pet food. The food is free from preservatives and colourings. 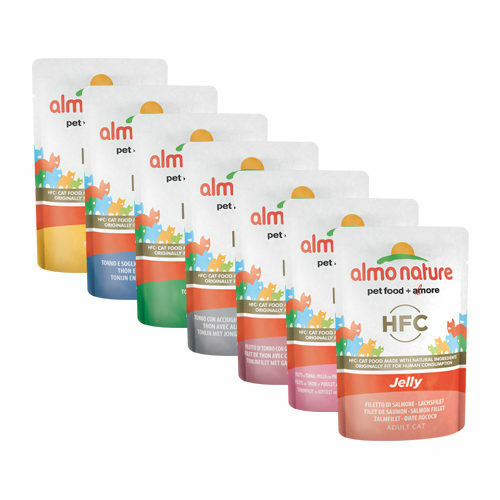 Almo Nature HFC - Jelly comes in 55 gram pouches in packs of 24 and is available in 7 different flavours. Have you used Almo Nature HFC - Jelly before? Let us know what you think about this product.